What does it take for children growing into adulthood to summon the courage to spread their wings and fly? 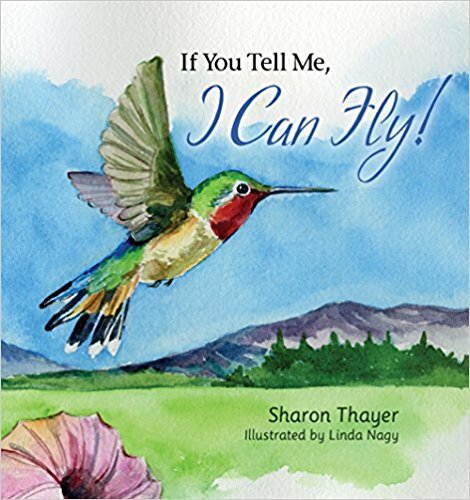 With stunning illustrations and Sharon Thayer’s subtle metaphors and inspirational conclusion, If You Tell Me, I Can Fly! is the perfect gift for anyone starting a new phase in their life. From small steps to giant leaps, the dream within takes flight with one simple, yet powerful message “You can fly!” Note: This book is geared towards children age 8 and above. Starting a new phase in life. In the face of challenges throughout life’s journey, the possibilities are endless if you believe you can fly. This inspirational book, using flying as a metaphor for success, is the perfect gift for children ages 8 through adult. The message in this book lets a special girl or boy in your life know you believe in them. If You Tell Me, I Can Fly! is the winner of 4 state and 2 national awards. About the Author: Sharon Thayer also is author of The Myth of Santa’s Beard. She is a former teacher and owner of a nature-based childcare center who now is a full-time author of children’s books. As a child growing up in Rockford, Ill., Thayer’s attempts to read were stymied by dyslexia, but today she enjoys reading aloud and sharing her stories with children.